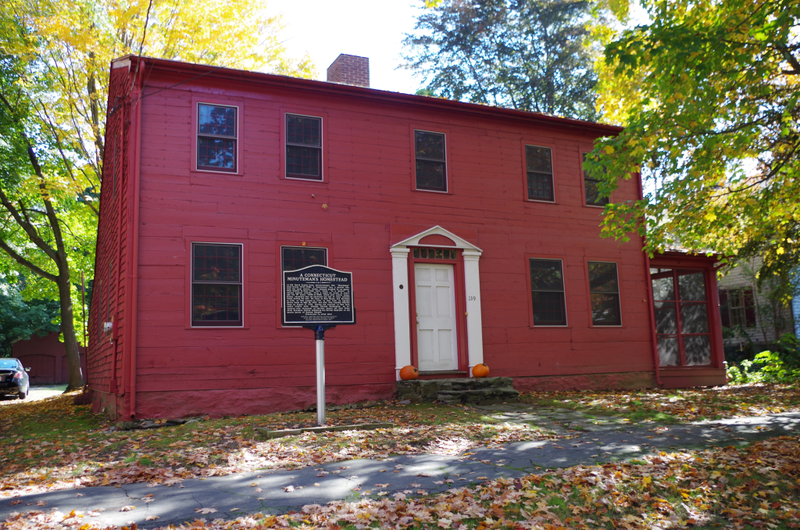 The Milford Preservation Trust will be opening the Minuteman House, aka John Downs House, at 139 North Street, for trick-or-treaters and guests of all ages, this Saturday, October 31, 2015, Halloween afternoon/evening, from 4:00 P.M. to 7:30 P.M.
Last year’s Halloween gathering featured the ghosts of Mr. and Mrs. Elijah Bryan (Richard and Jane Platt), and John Downs himself (portrayed by Timothy Chaucer). The ghost of John Downs, Milford’s Minuteman and Diarist, as well as other colonial ghosts, such as that of Joseph Plumb Martin — who’d chronicled General George Washington at Yorktown — will be on hand to show an 18th century powder horn, musket, cannonball, hot coal carrier, an 1798 sampler, gridiron, waffle iron, butter press, and other authentic historic items. 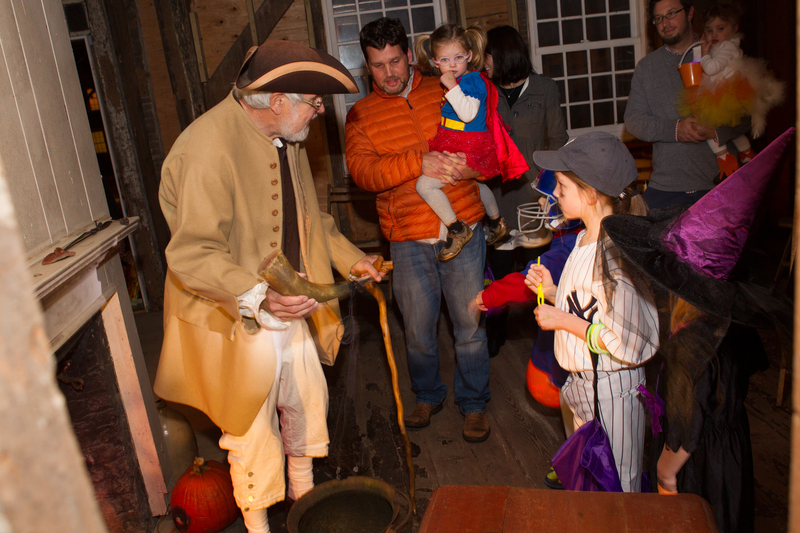 John Downs (Timothy Chaucer), demonstrating a powder horn and other 18th century artifacts to last year’s Halloween visitors. 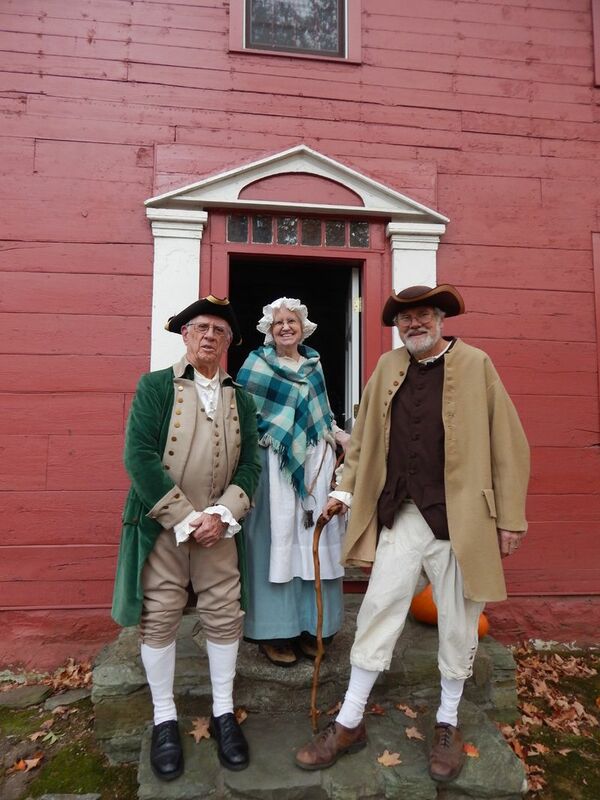 This event is free of charge; however, donations to help restore the hearth and floors of the Minuteman House will happily be accepted! Cider and donuts will be available. 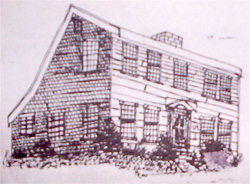 The Minute Man House (aka John Downs House) at 139 North Street, Milford, Connecticut. Please contact Michele Kramer, President, Milford Preservation Trust, at 203-314-9016, for additional information or questions. Thank you! I was cleaning out some old button jars and found two Minutemen Gathering pins, one dated 1942 and the other is 1947. I really have no need for them and thought if you would like to have them for your organization, I would gladly send them to you.